The Richmond Mural History - SPARCinLA We are SPARC: Art | Community | Education | Social Justice SPARC | Social & Public Art Resource Center | Creating Sites of Public Memory Since 1976 | Founded by Judy Baca, Donna Deitch & Christina Schlesinger | SPARC is a community cultural center that creates public art as a vehicle to promote civic dialogue, foster cross-cultural understanding, and address critical social issues. We accomplish our mission by producing, preserving and presenting community-based public art. SPARC is a facilitator Ð finding ways to tell richly textured stories that help community participants and artists achieve a measure of change and transformation. The city of Richmond is located 16 miles northeast of San Francisco, directly across San Francisco Bay. Richmond is on a peninsula separating San Francisco Bay (on the south) and San Pablo Bay (to the north), and the city has 32 total miles of shoreline. The city’s total area is 56.0 square miles, of which 33.7 are land area and 22.3 are water area. Richmond is situated near major metropolitan cities and major new growth areas. San Francisco is within 35 minutes from Richmond by freeway; Oakland is 20 minutes; San Jose is approximately one hour’s drive to the south; and Sacramento, the state capitol, is approximately 90 minutes to the east. The population within a 30-mile radius of Richmond is over 3.7 million, and within a 70-mile radius is approximately 7.8 million. Richmond is located on the western shore of Contra Costa County, and is the largest city in the “West County” region consisting of five cities: Richmond, El Cerrito, San Pablo, Hercules, and Pinole. The earliest inhabitants of Richmond were the Ohlone Indians, who settled here an estimated 5,000 years ago. Distinct and separate groups lived a stable and peaceful existence, with a culture based on strong community ties, spiritualism, and rich artistic creativity. The Ohlone were hunters and gatherers that built extensive shellmounds along the Bay. Amid the coming of the Europeans, the Ohlone way of life gradually came to an end and was destroyed. When Richmond incorporated as a city in 1905 it had a population of 2,150 and was already an established industrial town. The city charter was adopted in 1909, and by 1910 the town numbered 7,500. Within a few years the following substantial industries locate to Richmond: Winehaven, Pullman Palace Car Shops, American Radiator, Standard Sanitary Company, Stauffer Chemical Company, and several others less well known. Town sites began to emerge around these industries, as Rancho San Pablo’s vast grain fields were subdivided into uniform city lots. As the City grew during the 1920s and 1930s, Richmond’s Downtown emerged as the City’s business and retail center. The elegant Carquinez Hotel (later renamed Hotel Don) opened its doors in 1925 and soon became the center of the City’s social and civic life. Construction of shipping port terminals began in this period. By 1907 harbor construction was being promoted and major dredging and terminal construction was authorized by bond issues in 1912 and 1920. Tideland filling as part of the harbor dredging in the 1920s made possible the opening of the Ford Motor Assembly Plant and the Felice and Perelli Cannery in 1931. The prohibition era forced the closing of Winehaven. The City’s population, meanwhile, had grown from 2,150 in 1905 to 23,600 in 1940. The next chapter was by far the most dramatic and earth-shaking in Richmond’s history. World War II began, and the Kaiser Richmond Shipyards, one of the biggest wartime shipbuilding operations on the West Coast, sprang up on Richmond’s South Shoreline in January 1941. The result was explosive growth, large scale in-migration of workers, a “boomtown” atmosphere, and profound long-term effects on the City. The shipyards covered much of the vacant industrial land in the South Shoreline harbor area, requiring extensive additional tideland filling. Richmond’s population increased dramatically from 23,600 in 1940 to over 93,700 in 1943 as tens of thousands of new residents, White and Black, migrated from the economically depressed South and Southwest to work in the shipyards. Much of the new population was housed in temporary structures. Dormitories, demountable houses, and apartment buildings were built; more than 60,000 persons lived in public housing. Many “temporary” housing units remain today. At the end of the war, the shipyards closed in 1945 and a far-reaching readjustment began. Industrial production rapidly declined and the population decreased steadily from 101,500 persons in 1947 (a special census count) to 71,900 in 1960. A number of new industries moved in to occupy vacated shipyard structures. Among them were Kaiser Aircraft, Garwood, Butler, Southwest Welding, Pacific Vegetable Oil, United Heckathorn, and the first of the major warehousing operations, Ford Parts Depot and International Harvester. The Richmond Redevelopment Agency was formed in 1949 and undertook several redevelopment projects starting in the mid-1950s. Three of these were industrial projects (Harbor Gate, Galvin, and Terrace). The Harbor Gate Redevelopment Project cleared war housing in 1955, thereby providing sites for additional major warehouses such as Safeway and United Grocers. As new industries arrived, a number of old ones moved out. Ford moved to Milpitas in 1955 and the Pullman Shops closed in 1959. A strong growth in warehousing, distribution, and chemical and research facilities were evident among the post-war developments. Throughout this history Standard Oil, now called Chevron USA, and its subsidiaries, Chevron Chemical and (later) Chevron Research, have grown steadily and have remained the City’s major industry and employer, with the exception of the brief war-time shipbuilders. Four major developments since 1960 — Marina Bay, Hilltop Shopping Center, the new Knox Freeway, and the Richmond Parkway — have transformed Richmond’s geography as well as its economy. Starting in the mid-1970s the Harbour Redevelopment Project on the city’s South Shoreline led to the transformation of the old Inner Harbor Basin (the site of the wartime shipyards) into the Marina Bay development, a 350-acre master-planned waterfront community that will eventually comprise 2,100 residential units, 650,000 square feet of commercial space, several restaurants, a 1,500-berth pleasure boat marina, and a chain of lagoons, parks, and waterfront promenades. Opening in 1976, Hilltop Mall Regional Shopping Center had a major impact on Richmond’s economy and its old downtown area in particular. Hilltop is a 1.3 million square foot enclosed shopping center located in the northern corner of the City along Interstate 80. Richmond’s downtown business district began to decline in the early 1970s as its major retailers (Macy’s, J.C. Penney’s, Thrifty, and Woolworth’s) all either moved to Hilltop or closed their Richmond operations entirely. Another major event occurred in 1978 when the proposed Hoffman Freeway (now the Knox Freeway, Interstate 580) was designated a part of the Interstate freeway system, thereby ensuring its construction. Funding (90% Federal, 10% State) was attained in late 1982, crowning more than 25 years of efforts. Construction began in 1985 and was mostly completed by the end of 1991. The new freeway passes across Richmond’s South Shoreline and connects Interstate 80 with the Richmond-San Rafael Bridge. The freeway provided seven new interchanges along the South Shoreline, and has made it a very attractive corridor for new high-tech industrial, business park, and commercial development. The fourth major development transforming Richmond has been the construction of the Richmond Parkway, which began around 1990 and is still in progress. A “drivable route” along all sections of the Parkway was achieved by the end of 1994. The Parkway is a 7 1/2-mile, four lane scenic expressway providing a speedy link between the northern edge of Richmond (Interstate 80 at Hilltop) and the City’s southwest corner (the new I-580 freeway and the Richmond-San Rafael Bridge). The Parkway has fostered development of a large industrially zoned area in northwest Richmond that has historically remained largely underdeveloped, due to poor access. The City’s population remained within the 71,000 – 79,000 range from 1960 to 1987, with little new development until the early 1980s. Between 1987 and 1995, however, Richmond’s population grew steadily from 78,900 in 1987 to 93,000 in 1995. This dramatic increase was due primarily to the large number of new homes that were built in the El Sobrante, Hilltop, Brickyard Cove, Marina Bay, and City Center/Downtown areas during that period. The high rate of new housing construction, however, dropped off sharply beginning in 1992. Richmond covers 56 square miles and has a population estimated at 103,468 (source: CA State Dept. of Finance as of January 1, 2006). Richmond’s economy is currently undergoing a major transition from its former heavy industrial character toward more high technology (“high tech”) and light industrial companies with new business parks accommodating light industrial and “office/flex” land uses. Biotechnology, in particular, has developed as an important new “niche” in Richmond’s growing economy. At the same time, the City’s major manufacturers such as Chevron and Zeneca (formerly Stauffer Chemical) have continued to upgrade their Richmond facilities, making major investments to modernize and expand their facilities. Richmond is a growing maritime, industrial and residential community with a thriving and changing economy, a dynamic business environment, and a strong potential for further growth. Judy Baca and the SPARC team invited local residents to share what they felt was significant about their ancestry. Baca wanted to know the events that shaped Richmond, and how their family had contributed to shaping the city today. They asked them to bring a family photograph that showed their ancestry in Richmond or a home before they or their family arrived in Richmond. Judy Baca and her team assembled a workshop where they asked Richmond residents to describe their memories of Richmond. This is a transcript of their words. I remember Richmond having it’s own downtown area. It primarily occupied the stretch of Mac Donald Avenue from San Pablo Ave to 4th Street. Business such as Macy’s, Capwells. There were drugstores, doctor’s offices, lawyer’s offices, streetcars, etc. When my grandfather who was a farmer died, my grandmother and me had to switch places. They sold their orchards in San Juan Bautista and moved to San Francisco. There my grandmother started the first music school run by a woman. My grandfather kept the books and helped raise their 4 children. They had three pianos in their house and music all the time. I had to walk 3 miles to and from Jr. High school. I was out of my neighborhood. Once I walked past Barrett Ave the racial remarks started. The Richmond Police Dept had an officer who rode a motorcycle. He joined in the racial slurs towards us. Jr. High school students. The curriculum was great and my teachers were helpful to my education. Again, the diversity Italian, Mexican, Black was present. My best friend Sandra Derushia moved away to San Francisco. I surely missed her. We would meet at 7th and Pennsylvania to walk to school together. Often times Sandra and I would exchange our lunch box. She had luncheon meat sandwich and I had mayonnaise and butter sandwich. I came to Richmond at the age of 4 in 1942 with my mother and 5 sisters, one brother. Joseph Marlborough, my dad, and I attended and graduated from Peres Elementary School. I remember the diversity of that elementary school. I had to walk to and from school (one mile) each day. But, during the winter months a big yellow bus would pick us up in front of our house to go to school. After school, it would take us home. I remember the dedication from all my elementary school teachers to my education. I walked to and from High School (5 miles). We could not afford bus fare (12cents) one way. Once I arrived at the 13th streets (Rumrill Street) the racial remarks began. I was subjected to being called a Niger from small children as young as three years old. The high school curriculum was accommodating. I almost failed in my career classes. I felt intimidated by the career teacher. She would bring job market information to the class as a whole, but frequently commented “this position is for white only.” Most of the positions where from the major banking companies, etc, Bank of America. College preparatory classes were not encouraged for African Americans. Upon graduation from high school I applied from employment and became successful. 510.233.2466 Yvonne Marlborough. 284 Vernon Ave, Richmond CA, 7 blocks away, head west over tracks. Marlborough Boarding male dad would work. Grandma did cooking at Boarding house to bring family. Chevron employees came to Mini Lu’s Redlight to drugs. Spirit of Mini Lu’s, Church was sevoy. Spirit and the music – big part of the history. 100,000 people lost jobs day war ended. Moves south side. Coming up – North Richmond Red Lined. 80’s John T Knox freeway diminished homes, Displaces over a hundred families. Citizen action league evon. Potbelly stome GM – prepare soup grew farms made soup from farms. The smell pigs, chickens. I remember when no Richmond was mini mecca for entertainment. It was the town where Mini Lue’s was located and many musical bands came to entertain. Grove Street, Silver Ave and 5th street was the same as 125th in Harlem; it was were the “happenings” were. Before the war lots were $25 Beulah, Mother Harriet Bought Willard Street, 1st street near the RR tracks. The church is still there at Willard and 5th street. She built the house church. She worked at the shipyard my uncle thought price would go down after the war, but the prices stayed high. My father didn’t let my mother buy property because he thought the prices would go down, but it didn’t. I remember riding out 3rd street to the area where horses stables were located. I would park my vehicle and observe the animals being fed as I drank in heavy doses of the wildest smell of the horses. There was an issue with the crematorium. There was a total support from all parts of the community. Red, Brown, Yellow, Black, and White came together to a crushing defeat for the measure. That was unique. Yugoslavians, Sicilians, Portuguese, Mexicans, and Negroes, all from Circa. 1920’s living in North Richmond. Manual Labor, Factories, Standard Oil industry based incomes. City garbage dump in Gertrude Street where re-cycles and industry was created and north Richmond was used as the dumping place for all things to dump. The war, WWII when our oction (?) changed from a NY accent to a pronounced southern United States infliction. The war’s population explosion. Making ave for the war. The clubs, gambling, vice and the all prevailing system or capitalism with the wait poner structure as JT benefactor and leader. Wars end and the taken – back of the many resources and promises. The influx of illicit drugs, the systems exploitation of this. Progress justified and measured in terms of waite gains and growth inhuman and spiritual development. I remember going to the carnivals at Nichol Park. My grandmother who didn’t have a driver’s license or car would walk my cousins and I from cutting and south 49th street to McDonalds ave. We always had to have com-dogs with mustard and the pink candy corn. The swings were my favorite ride being so high above the ground in the wind, you could look out over the park and city and see all the people. I just felt so happy and free. My family came to Richmond from Greenride Mississippi and Arkansas back in the 1940’s for work. Imagine at the time my great grandfather had heard there were jobs and better opportunities. Both my mother and fathers side migrated to the west from the south. Eventually both sides of the family settled in Richmond and as fate would it, became next door neighbors. 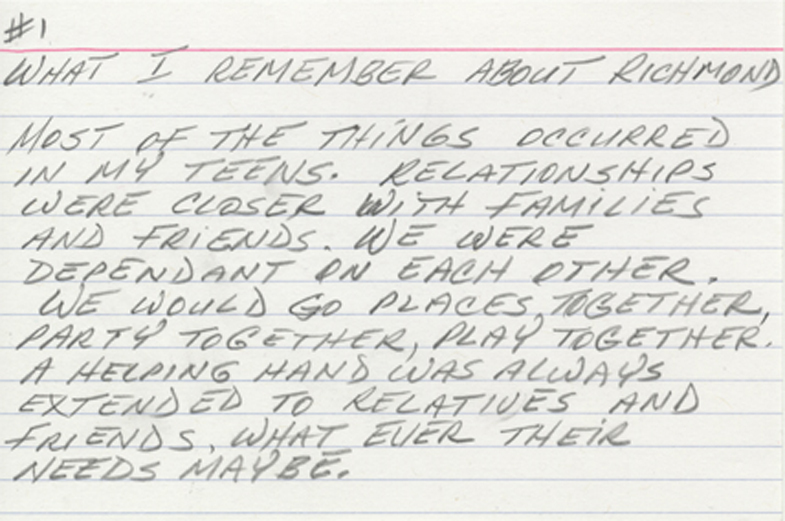 My mom and Dad met because they lived right to each other. 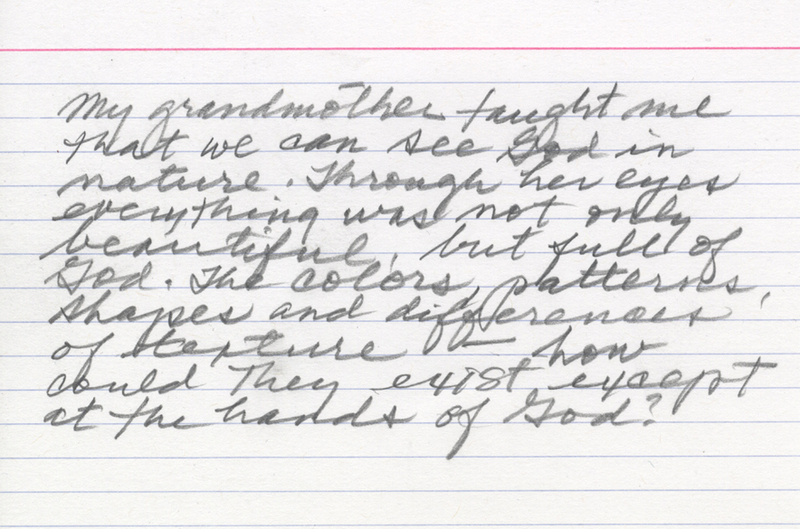 My grandmother taught me that we can see God in nature. Through her eyes everything was not only beautiful, but full of God. The colors, patterns, shapes and differences of texture – how could they exist except at the hands of God? What I remember about Richmond: Most the things occurred in my teens. Relationships were closer with families and friends. We were dependent on each other. We would go places together, party together, play together. A helping hand was always extended to relatives and friends. Whatever their needs may be. I recall I did things with friends, I wouldn’t dare do now. Like rowing the bay in a leaky boat. We would go out to the water breakers to get military sea food. That had washed up on the breakers. As we grew older, we drifted apart from our friends and relatives. As we grew older. I also remember and have witnessed the revolving transformation. I work in the fruit fields side by side with the migrants farm workings. My great-great grandmother came from New Orleans to Carlifornia in a covered wagon. They settled in San Juan Bautista where they became farmers. Their love of nature and the land was passed down to each other. The history of Combs family that lived in North Richmond. We came from Long View Texas. At the time there were 7 children in 1944. We came from Texas on the train. I remember the soldiers were on the train they fee (?) us all. Seven children we came to live in North Richmond. But my mother joined McGothen temple first the singing started with the combs family as the duet – 2 sisters Shirley and Zell Combs much Saty we moved to North Richmond. Next door to Savary cub on the corner mother Combs got the calling from God as foundry of Green Pasters church. 217 chesley ave, nor there was 10 children in the Rellinen. Out of the 10 children there was history made. Started a church and picked up children to come to the sewich. The church grew by scraps and bonds it still there a 217 chelsey ave roth Richmond. 47 year Both mother and father Combs has gone on. There are 3 ministers, o happy day. Jerry Combs was Deceased one month ago. He was with hair in the stage production. Jesus Christ superstar he was with women brothers, he was a courageous Far. Hew was call to the minestry playa gutter. The memories my parents always told me were that when they met were that my father was the central American war that took place in Honduras, El Salvador and Nicaragua. My father was born in Nicaragua and my mother in Honduras in 1985. I Carlos Adan Meza was born as my father immigrated to California to make something better for his family so he came to San Pablo, California. He worked for a motel called Gables Motel located in San Pablo. The motel was owned by Arabic people who took him in and treated him as family. I remember my father telling me he used to live under a path in San Pablo because he was saving his money to bring his family to the United States of America to be close to him in 1989. My father had got his wish to see his family come to live in the United States. We started to live in a trailer that the owners of the motel gave my father. Because he now had a family, we lived there for a couple of months then we moved to North Richmond in 1990 because my father started to work for Chevron and wanted to live closer to his work. We were one of the few non-colored families there in North Richmond. I remember seeing chickens and farm animals in the people’s back yards were the chickens used to always jump over our gate to our yard and my parents used to always chase them away. Now my mother has chickens in her yard. My mother started working at a school named Verde Elementary School in a project called the Verde School Garden Project were she helps build gardens and landscaping projects. Two of my youngest brothers work with her. They are learning how to do what she was taught to do. One of my youngest brothers teacher’s both his children who are ages 3 and one and a half, he teaches them how to plant, use tools and teach them what the plants names are because my mother wants her grand children to know what their grandmother knew what to do. Even though she didn’t know any English and only spoke Spanish and her job was to be a farm worker. She has been working for Verde Elementary almost ten years. I am now 24 years old who speaks both English and Spanish with a high school diploma and a B/A in Computer Programming and I am teaching my mother the stuff I know so she has other things to know. Because I really want her to just be now as a farm worker. By her grand children I am returning the help to my community of North Richmond because they helped me go back to school to make me because something of my self and I am thankful that I got the help. When I came here there was only 10-11 black families. North Richmond was a (?) town all by beef. It had it’s own grocery store with grain and feed. Rick Sanitary had 7 trucks, parking was right behind Bobby Zillis house over on Castro. Scotty station on Sanford and 3rd. (?) station, across the street was Dans Gas station owned by a black meal. Got our first phone in 1950 we had to have a business in order to have a telephone. We had Mr. Pippens Garage shop. My family came in 1943or 44 from Texas. Got to trade a list cause my father had a trucking company and he hauled bricks from what’s now Brickyard Cove. Uptown area what we used to call it over on McDonald. Every Saturday evening up town to do shopping. JC Penney’s. Tracellinis Furniture best store in town. We had only one dentist in town on 4th street and McDonald. Back then N. Richmond grocery was like Safeway, a large supermarket. Faith based orgs – Involved in community healing – Downtown buildings owned by churches known by churches they volunteered in. It’s arts, it’s music – performing based musical backgrounds and many places to play. Oakland to North Richmond Rhythm and Blues – Richmond Civic Auditorium. Talent shows. Richmond Arts Center first in the nation – used as a model 1948 to 1950, 20 years before – community initiated woman who blinked with art supplies. People engaged outside outdoors relating to neighbors – creating public space in front and backyards – an interest in their day to day environment. 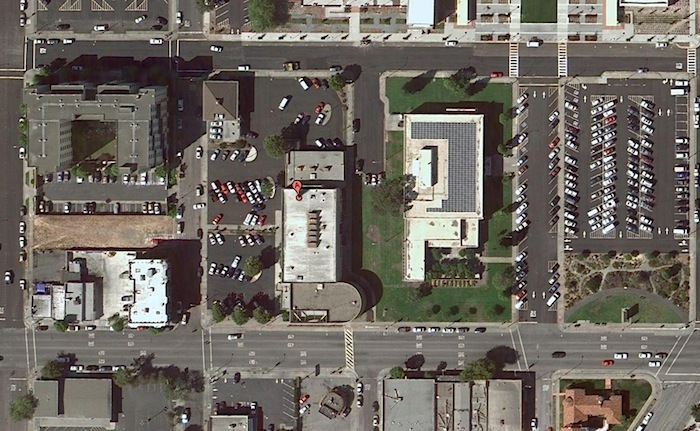 Share space, exchange building and installation of solar panels creek restoration – naturalize flood control station. Undo this to improve erosion problems landscapers giving hydrology education. “Victory Gardens” Gardens at school tech to grown food Berryland – Being led – educate youth – Richmond tails books. Pride and Service learning projects Oil interests. City is pushing back the oil industry High Asthma rates and high cancer rates. Cold smell Chevron – Sirens 1st Wednesday at 11am settlement check from Chevron plume! Paint was being eaten off the cars. Alerts only went our in English. No phone tree more than one language. Chevron was not paying taxes till last year “this is what we owe you but never paid. The tax base economically dependent in Chevron Pixar began in Richmond. Responsible economics. Home to me is a mix of the South and the sea. The sea is the lack of charge clarity – lack of contact with the bay – feeling of being landlocked on the block – the south is all of the ways and stories that would come flooding out if people had an opportunity to make a comm.(?) share the internal selves due seem to keep inside – like the barred windows and doors – some much life lived outside of the public consciousness – my mom refused to ever have bars the house – we were never broken in to. I remember ridding my wildflower dirt bike through the field on 5th street that the kids had turned into a makeshift BMX course. I remember the blackberry bushes lining the parts and the blackberry juice stains on my shirt and always being my to make a blackberry pie. I remember all of the broken glass from 5th bomes green, clear brown – shimmering in the course . I remember wandering down Ohio with my cousins after church from Bra St. to Pat’s Papershack and buying picked pigs feet, pickles and stuffing them with now ‘n’ laters – and sucking on chico sticks. *a picture of PAT has to be in this mural. I remember my 1st MLK national 2009 day of service on the greenway 300 people volunteering to raise gardens where there was once broken glass, concrete and abandoned railroad ties. I remember my mom dancing at Pt. Pindle Regional Park for the 4th North Richmond Shoreling festival and the tug of war – where 6 kids on either side of the rope and Mt. Tamalpas and the San Pablo Bay (?) then sildhested. I remember packing 300 native plants in my little car Toyota corolla clown car for a creek restoration project MLK Day 2008 in East Oakland while the Chevron Sirens when off down thities celebration of MLK’s birth and life. I remember walking home from school (Adams) with about 20 of us everyday and getting into some kind of mischief every so often. I remember the pro-immigrant rights march in May 2001 when we filled the court yard of the civic center. It was beautiful. I remember when Richmond passed a resolution in favor of immigrants. I remember my first house party. I was 13. I danced with Allison. Someone shot at the house, we all scattered. I think they were looking for Sharkey. My barber is named Pierre, he is from Haiti. It’s an “all black shop.” When I first went there I was like 15 they asked if I was lost. It’s like home now. Richmond is home because the city embraced me. Black, white, latino, rich or poor you were a Richmond resident, everyone was family. I remember my first joint. We smoked it at Kellers Beach. I stole the joint from my parents closet. I remember riding my bike to the RAC and asking if I could take classes although I could not pay. They enrolled in a drawing class. I remember working in SF and having a couple teachers from Richmond come to the Precita Eyes mural center asking for an artist to come help put some color in their school. This was 2003 since I feel that there is more creativity here in Richmond. I see more public artwork. I remember working with students on a mural project. One particular student thanked the artist for helping her feel like she was in a dream. All the children were super excited to pain on their school. I remember stories of folks talking about the emergency horns ringing whenever the oil plants has an accident. Yellow skies and cancer prone people. Also how there are protests at the refinery. I remember being in 7th grade and our school district on the verge of bankruptcy and our kids still having to go through the effects of it. I remember meeting so many wonderful Richmond people while organizing for the march for education and fast for education and then opening up the making changes freedom school. I remember hanging out at the hilltop mall as a teenager. I remember marching down 23rd street in the rain for the children’s march. I remember going to the weddings and parties at Veteran’s hall on 23rd street. I remember having to go to the doctor because of the Chevron refinery explosions. I remember as a young woman of 24 looking for a place to rent and responding to an ad listing a small house near the water. I was living in El Sombronte, had lived in the Beverly flats and had walked an hour to the Berkley marine whenever possible. I called and flatly said I knew of no place in the East Bay where one ever lived close to the water. I discovered Point Richmond and have lived here 45 years. I remember my first visit to City Hall as member of the Arts and Culture Commission. I was welcomed by the mayor, met the Cm 8 staff and the openers (?) of the experience. I remember feeling the “realness” of everyone. People volunteered readily – worked to make the city better. I found people where the heart of Richmond. It was falling in love with a whole city. As a young artist I was directed to the Richmond Art Center. I found it a hub of artistic activity, made new friends and discovered Ernie Kim, the ceramics instructor, and excitement working with city. As I worked long hours I really only knew the RAC, the artists there that became my new friends, and my immediate neighbors. That was enough. We all valued the importance of community. I had monthly Raku. Just bringing together my neighbors with ceramic artists. As a young RAC board member, I met Angel Salmi – the founder of RAC. She became a mentor – her belief in the power of art to bring people together took her into the neighborhoods of Richmond – with a suitcase full of art supplies or the story is told. She never (?) her work to make the emergency (?) of art – at all levels – available to the people. She was responsible for including the Richmond Art Center into the Civic Center – the K1 community Art Center in the country. My mom was a “prayer warrior.” Wanda, mother, heard the cries of her native people suffering from substance abuse, violence, alcoholism and lack of mental health services, most of the ways. 2006 she was given a vision. That vision was to bring services to the Native Americans here in Richmond, to help her people break the vicious cycles that are destroying her people, and remember and be proud to be Native American. Mother Wanda, begin her walk, literally she did not drive, and used her telephone to bring awareness to the underserved Native community in Richmond of services. Wanda was called home to be with our lord in 2008. I, Courtney continued her walk. Her vision is now a reality, she recruited Janet King of Oakland Native American Health Center to work with her. Oct. 16, 2009. The sister site of Oakland and San Fransico Native American Health Center will open the Native Wellness Center of Richmond and the facility will be dedicated in honor to her with a plaque and special cure many. It all happened with one voice. I’m third generation of my family who lived here in Richmond since 1940’s. At one time over 300 families lived on the Santa Fe Railroad Property known as the Santa Fe Indian Village. I’m Acoma Pueblo from New Mexico on my mother’s side. Acoma/ Laguna Pueblo people were brought here, given jobs in part exchange for the railroad going through our lands in New Mexico. Growing up in the Indian Village was very unique. I remember having our dances and celebrations just like on the reservation. My mother tells me of when she was a little girl how the parade of dolphins would swim the bay. She would be watching from the Point Richmond Hills. I will send stories of the village and also possibly photos via email. Thanks Judy for the forum of having the Indian community involved. My husband Michael lived in the Santa Fe Indian Village (middle of the SF Railroad Yard) in Richmond – with his “Indian Family” when he was 18 years old. Pop Sanchez and family were Acomas and we are still in truch until the family – with photographs and video interviews about the Acomas and their life in the Richmond village. I arrived in the bay Area 1960 on the train to Oakland from Altus Obla. On the relocation program. Came to the Bay Area with 3 children, youngest was 9 months old. Came to the Bay Area to better our lives. I came to the Bay Area and started meeting other Native American People. Became involved in Intertribal Friendship House, where a lot of Older native Americans came to socialize. Also started attending church, at the American Indian Baptist Church, still attend there and lead our songs at Sunday Services. Lived in Oakland many years raised my children there, lost my younger in Jan of 2009 from drugs. I remember the Indian Village here in Richmond, the outdoor oven is there. Getting kicked out of high school for fighting. From Richmond I ride my bike to Napa SF Minga Concord. Gangs chasing me down 23rd – mistaking me for a gang member. Cinco de Mayo – 300 gangs chasing us. It’s all I know and in this hell I feel safe no matter where I am. I been here my entire life. I graduated high school from vista in Richmond. It was a great new school with tons of amazing teachers who helped their students change for the better. Richmond in my home now because I moved here for my boyfriend. Now were starting a family in his home town and we can show our daughter the painting and we can say we were of it. Richmond is home but also a dangerous town from gangs, drugs, shootings, killings. I was born in 2000 and I have learned a lot in school and I like school and I am going to stay in school and I love my dad and me and my play video games. What brought me to Richmond, CA? I came to Richmond in 1989 with one daughter and there great niece and great nephew after living in San Francisco for a year. The thing that brough mehere was the eighty nine earthquake and the need four bedroom for my newly acquired family. The things that keeps me here is my job, children’s in school and because I don’t like to move. My grandparents owned Rudy’s Refrigeration on 13th street in Richmond from the 1940’s through the late 80’s or early 90’s. Understanding lean times, they sold appliances to people on a payment plan, while the people used the appliances in their homes. In all those years of trust, there was only one family who did not finish making their payments. My brother and sister and I spend a lot of time at my parents business and their home above their business when we were children. I remember listening to the sound of the train whistle as I fell asleep at their house. When I was 5 years old, we were playing on the 2nd floor roof. It is still not understood whether I pushed off the 2nd floor to the ground or if I tried to fly. My memory is that I believed so strongly that I could fly that I went ahead and tried. Part of me still believes I can fly. I come from a long line of strong women. Both of my grandmothers worked in the Oakland shipyards during WWII. They have told me stories, some funny, some not, about their experiences. I have been all over the world and always come back here. My husband says it must be because my umbilical cord is in the Richcomnd dump! I got lost from school. I thought school was done and 8th wandry an Sau Pablo. A friend of my suslusland me ?????? My parents grew up in the Indian territory in Oklahoma – came to Richmond when our farm flooded and crys was lost the day before harvest. They were immigrant farm workers “okies” – and came to Richmond just before my oldest sister was born – in the Richmond Hospital on 23rd street. I started kindergarten at Nystem Elen in Richmond – graduated from Richmond Highschool then taught there for 23 years – still live in Richmond and teach students to make digital stories and TV shows. I have photos of the boxcans that the Acmas live in from 1930’s – 1982 – and of Indians in newspapers then as children – whole family – and now as adults. And audio recordings of the chief chanting – and photos of the tribe back at the reservation in NM after they left Richmond. San Pablo grew food farming brought natives to feed mission Dolores. I remember when we came to Richmond and during shipyard days my mom worked at the shipyard. #3 she skilled ships, then the wawr. After the war we moved to North Richmond which was nothing but mud and weird. Few houses and two churches. I went to school in Richmond. I graduated there from Richmond high. I went to CCC learning therer. I went to work for Dr. S. Weeks part time. Dr. JC Robinson, Dr. Wright for a few years. Then I went to U.C. Hospital to get my nurses license. I finished ent to work in Martinez. My start in Richmond I went to L.A> were I run mayor Bradley office for election. Also Maxine Waters office for congress won. I taught music I had a part in Fred Jackson Music. I came to Richmond in 1976. I came because of the affordability of the houses near Hilltop. I’m from Jamaica. I came in 1969. I first lived in Daly City. When I was ready to buy, I bought in Pacifica. I saw houses in Pacifica on the only sunny day. After I moved there it was always foggy. People laughed at me. I missed everything about Jamaica. I go back every year. Sometimes I stay for 6 months. Her neighbors here were warm and friendly. Worked as a claims examiner at Blue Shield. My children live in the Bay Area + A2. I met my husband while working for the United Nation’s Food Agricultural Organization in Malaysia. He was after me all the time. I gave in. We married in Malaysia in 1970, in a Buddhist Temple. He returned to the US. I came in 1973. The United States did not recognize a Buddhist marriage. We remarried in Reno so I could emigrate. He bought a house in Pinole. Only 930 people lived there. I was the only Asian in Linda Heights. My neighbors saw me a couple of times. They closed their door. Sold their house in a couple of weeks later. My husband found out they moved because of me. I was very isolated. The first month I moved here we went out to eat every day. I didn’t know how to cook. In Malaysia we had servants. I am Malaysian. My name is Christina Lai. I came to USA and stayed in Richmond City for 45 years. Worked at Richmond High School. I came here as a Bride from Hong Kong. My husband used to be a mechanical engineer. He came to Hong Kong in June 1964 and we got married in August 8, 1964. To me he is so handsome and tall and sweet and nice guy, and very gentle. We are still together now. When I got married my Ma gave me gold bracelet, chain, and also jade necklace and pearl necklace. And made some beautiful long Chinese dress and gowns. Also my Ma gave a beautiful, beautiful wood chest for wedding. My cousin from SF introduced my husband to me. So he came to Hong Kong to meet me. The reason why I provided the service for the Richmond Senior Center. Due to there are not any party activities for the seniors there. I started my service 7 years ago and I will continue my service. Organize parties and trips to places like shopping trips and field trips. I moved to Richmond twenty-one years ago. I had discovered a new neighborhoods nestled in the El Sobrante Valley which was a quiet haven away from the hustle and bustle of the city. Three years ago I discovered the Richmond Senior Center. It offered a varied series of activities for seniors and is a great place to meet people & socialize. We in the “strong women/people stay young” class had formed a strong bond with each other. I also learned to play Mah Jong at the Richmond Annex. I came to USA on 1970 September. I met my husband one year before in Hong Kong. We got marry in Hong Kong one week later. He went back to USA. I came over half year later. Since that time we live in Richmond Height until now. I packed lots of new clothing. Whole set of kitchen ware. Fabrics. Vase. Shoes. Wigs and Jewels. I like USA because the people are so friendly and the air very fresh. Lots of play area for kids. This helps me with my disability. My name is Helen Austin & I am 79 years old. I have seven children & they went to St. Cornelius school & Salisein & Holy Name. My daughter is Masachuesette University they all went school in Richmond & Oakalnd holy names. When we came to Richmond 1967there is Macy & J C Penny & Milen Juwly Stores at downtown of Richmond. And Nicol Park had zoo. I came for affordable safe housing, 1974. Working in Oakland, it [Richmond] seemed far away. There wasn’t a lot of traffic. It also seemed cold. Strong Women Stay Young is the reason I come to the RSC. It is the only class available for seniors now to help with our health issues since they cancelled all other classes pertaining to exercises. < Go Back To The Main Page on The Richmond Mural.